I've always liked the modular cutter from Traveller. I like the idea of a ship having a lot of utility and to be able to meet a wide variety of needs. 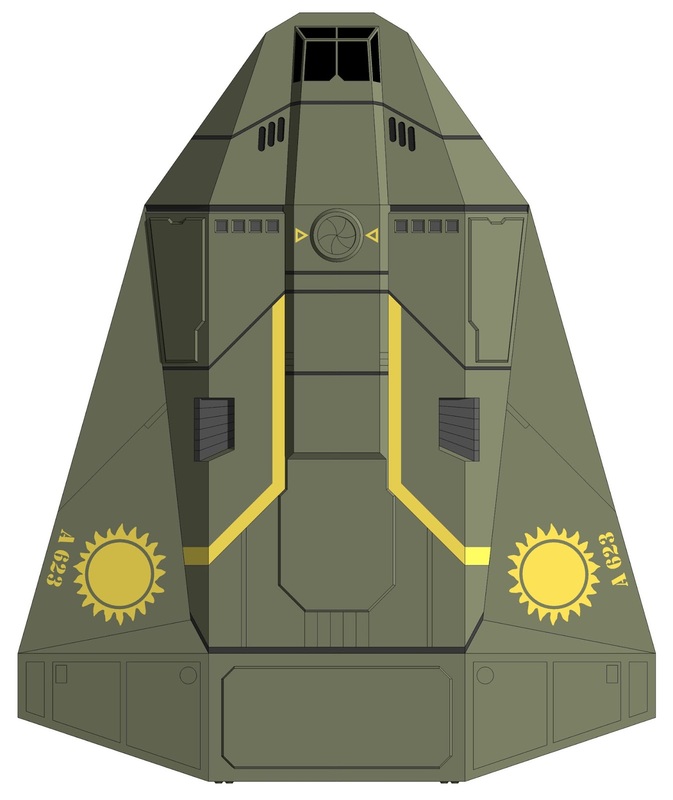 I also like several of the dropships I've seen in popular media, in particular the Pelican from the Halo video game, and the Cheyenne from the movie Aliens. The idea that you can quickly be put into the thick of things with all your gear, or call for a quick rescue is appealing. So this is my take on a dropship, which I see as being a mix between the modular cutter and a more typical dropship. The Nirvana does not contain any of its own cargo space, but instead relies on a pre-fabricated, standardized payload "shell", which can be outfitted as necessary depending upon need. Used primarily for trips from orbit to the surface and back, or surface to surface hops, this ship is not intended for extended travel periods. It is not necessary to drop the shell off as part of a mission. Some Nirvana have been used solely for shuttling loose cargo and vehicles, and the shell never needs to leave its cradle. Although the images show a military version of the Nirvana, it is also used widely in the private sector, primarily for small cargo runs, passenger ferrying, and providing rescue and humanitarian aid. Commercial versions of the Nirvana typically switch out the turrets for bridge and passenger related comforts, such as a small fresher and bunk area. The payload shell itself is of modular construction. The unit as shown contains four 10' deep sections. The forward section is empty, and features an iris valve hatch and two round windows, which are designed to align with the Nirvana's rear hatch and allows access between the bridge and the payload shell. The middle two sections are standard empty/cargo units and are completely modifiable. The aft section utilizes a rear wall which can be lowered to act as a ramp. This is extremely beneficial for off-loading troops or vehicles in a hurry. Payload shells intending to carry passengers or live cargo are outfitted with the necessary life support systems and meet the basic requirements for any spacecraft. Most shells will include grav-plates in the floor decking, but these are sometimes eliminated when the shell will primarily be used to deliver cargo. The shell can be outfitted with auto-leveling feet for use on uneven grade, so minimal site preparation is required. There are a variety of additional shell modules types to meet just about any need. 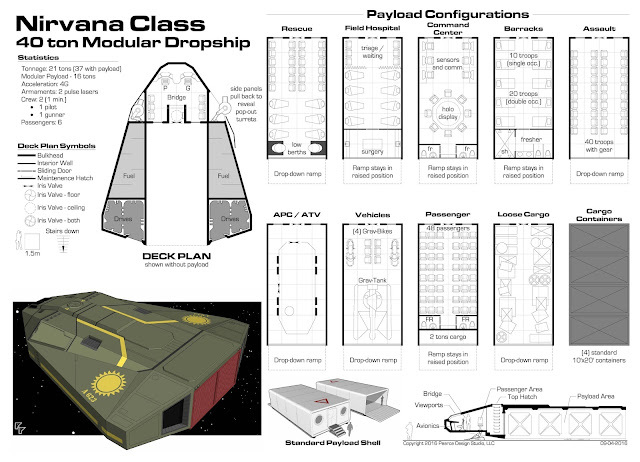 For a higher resolution PDF, click this link: (Traveller Nirvana Class Dropship). The deckplan was created to be printed out on 30"x42". Scale is 1" = 5'-0" so it can be used with 25mm miniatures. Enjoy! Thanks for your cool droship, ... as an French Canadian, i use my universal Star Trek translator, and a measure converter, it's necessary to explore blogs from strangers.